This is a root tutorial of Micromax A120 Canvas 2 color. In this guide you will find all steps with image, therefore it is a safe and easy method of rooting your Micromax A120 Canvas 2 color without a PC. Micromax A120 Canvas 2 color has 1.3GHz quad core processor. Along with it has 1 GB RAM which is good option for Smartphone’s gaming. It has 4 GB internal memory. In which 0.98 GB is for apps and 1.61 GB is for users data. This phone has 5 inches screen size. Its resolution is of 1280*720 pixels. Its screen is made of IPS display technique in which one can see about 16.7 million colors. The Micromax A120 Canvas 2 has superb performance, you must be root your phone, because root allows for you to use a maximum of your phone without any restrictions. After root you can install custom Rom, custom setting and apps on your phone. Read Root Advantage and Disadvantage by this post, then follow these steps and root your phone. Step 2: Copy Framaroot app in your phone internal storage or external SD card. Step 3: Go to setting >>> tap on security >>> tick on the unknown sources box (After install un-tick this option doesn’t forget it). Step 4: Install Framaroot App on your phone. After then tap on App file >>> You will get a popup tab then select by tap on the verify and install option >>> After then tap on Just once option >>> Now tap on install. Step 5: After completion, you will get two option first one “Done” and second one “Open” . Now tap on the open and run Framaroot App and Now Select “Install Super Su”. After this root process, you will find the Su app in your application menu. You can manage your rooted phone by Su app. Su app work as like firewall, So you should be careful in giving permission to the any app by Su app. If you want to check your Mobile rooted or not try this app Root checker. It is must for you to know how to unroot your phone. When you feel that you don’t want rooted phone, then you can easily un-install the root app and unroot your phone. 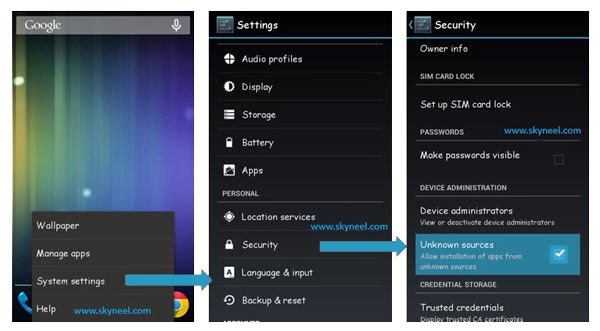 Here are simple steps to unroot your device. You can also see an unroot process in this image. This is simple and easy root process for your device. I can try to make it easy and make all steps clear to understand and try to make the image all steps for you. If you feel any problem, then please comment us. I try to best resolve your problem. Thanks and Credits: Alephzain Developer of Framaroot App. Im using Micromax A120(8GB) i want to install more apps but when im trying to download apps from play store it showing in sufficient storage space in that time (Setting->apps) showing downloaded app 951 MB used 48 MB free . my question is by rooting my phone can i increase my app install memory can you help me? I want to root my phone before insert the Memory card in phone? My phone is Micromax A120. Originally it had Jellybean OS. But I upgraded it to Kitkat. Which process should I follow to root it? Thanks Sir. I will try this method. Can you tell me your grand prime model number. How to root micromax A120 Jellybean 4.4.2 ,i was used your tutorial but some error occur .plz help me sir,plz reply !! 4.4.2 is kitkat bro.. not jellybean.. I cannot make it SIR !…. (1) I tick UNKNOWN SOURCE.. I want to root my phone ….help me If U can PLEASE SIR! I just rooted my phone using this tutorial and installed CWM…but now my phone isnt starting..when i, booting my phone only the logo is appearing but i cannot access my phone…please help !!! Mmx canvas 2 Colour kitkat version 8gb or older canvas 2 Colour 4gb kitkat version are not supported for frameroot rooting app.The reason because its only for Jelly bean version.If developeers update the frameroot app then it will be supported.Till now only pc rooting method is available. the 'move to sd card option' is not enabled on my phone it is showing but is not enabled what should i do? Wifi is not working on my micromax a120 colours. Should I return it to showroom. i have also the KitKat version. Had you find a solution to that? or anybody else can help me on this issue? go to service centre they will update it. I will try to upload. I would like to buy a replacement battery for canvas 2 colours…but cnt find any…..
Can i use that of canvas hd??? It gets rooted but unable to sign in to Google Play after rooting. Had to unroot it to get back to normal state. Pls help. Pls upload twrp /cwm recovery ,if possible post a guide or tutorial on how to port rom for mt6582 devices. And thanks for the rooting guide.